Are you wondering what to do with the new YouTube look and feel? 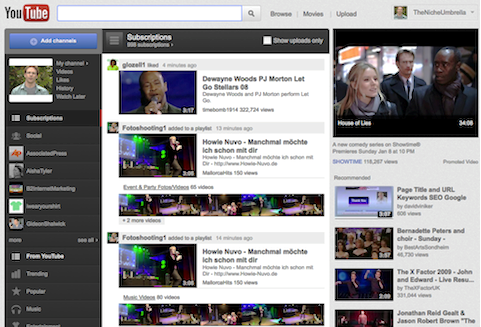 Many people either love or hate YouTube’s platform facelift. Whatever your preference, in this article I’m going to outline some of the best ways to optimize the new YouTube layout. Frankly, YouTube’s new design is turning out to be a step in the right direction. YouTube has managed to add a layer of user experience and brand factor, which are only getting better. This evolution will soon prove highly beneficial to YouTube channel owners. YouTube's social home page power. Here are 5 tweaks you can make to improve branding on your YouTube Channel. This option is now at the top on the right of your video. Talk about brand power. Previously, only partners could take advantage of this prime channel real estate. However, you don’t have to be a partner to place your URL links in plain sight to the right of the video. Before, your links were drowning below the fold (scroll down) to the left. Now your channel description area is to the right of the video above the fold. That means a higher potential click-through rate to your outside sites. Plus you can add your social media links in the description area, such as Facebook, Twitter and now Google+. Brand juice for non-partner channels. This is a huge opportunity! Most people don’t know about this feature. YouTube promotions are a vastly under-used resource for traffic generation (98 of AdAge‘s Top 100 advertisers can’t be wrong). Previous YouTube guidelines required you to promote your videos in order to take advantage of YouTube’s self-branded overlays. However, YouTube has changed that requirement. You don’t need to have a running and approved promotion for a specific video to take advantage of overlays. Now you can simply create the promoted video, pause the campaign and still have the power of the branded overlay. Create a custom ad for your overlay. 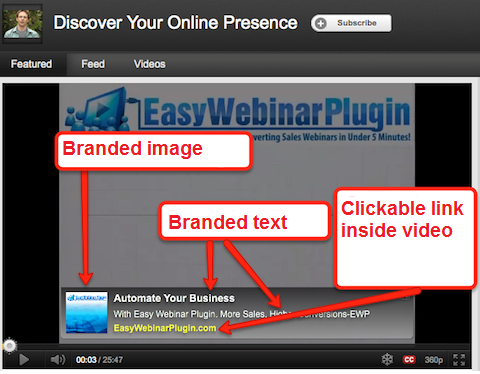 This is of course useful and necessary once you add your own branded and clickable overlay to your featured video. Also, if you opt to have your newest video as the featured video, then you’ll only have to make this selection once and it will apply to all of your featured videos. Simply click on the Edit button found directly over the featured video. 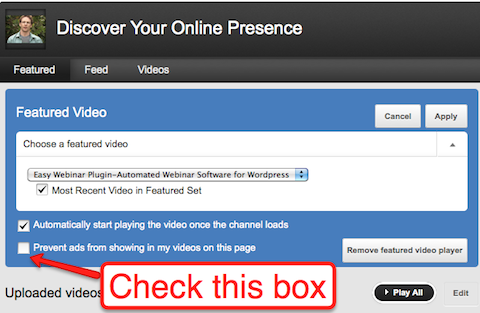 Click the Edit button above your featured video. From there, you can edit the information. Check the "Prevent ads from showing in my videos on this page." It allows your existing subscribers to see your latest videos and the comments you make on other channels and videos (as well as any updates that you mention). The “Feed” tab not only brings your subscribers that much closer to seeing your channel comments, but they’re more likely to dive in and start commenting themselves to keep up with the conversations. This can be found in the Edit Channel feature. 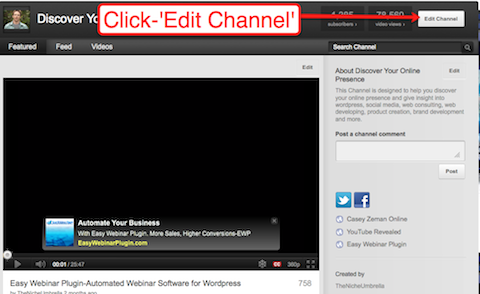 Click the Edit Channel button to begin editing your channel. Once in Info and Settings, check the "Always take subscribed users to the feed tab." YouTube is a social network site (many of us forget that). That being said, treating your YouTube Channel as your traffic filter to your external links can only work well if there’s solid engagement on the channel page itself. 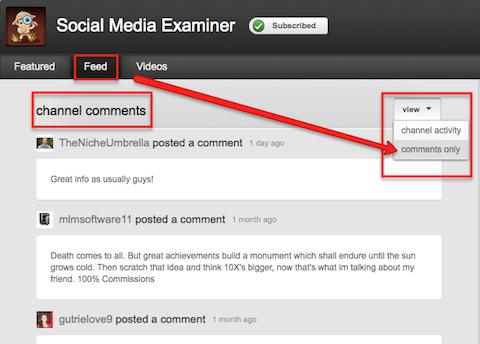 From the Feed tab, you can choose to click through to comments only or channel activity. For instance, if you’re trying to build engagement within YouTube, commenting on other YouTube channels is a great way to get them to come back to yours. Ask questions. Engage in thoughtful conversation. As far as the new layout goes, channel commenting is one of the only features that seem a bit lacking from the user experience and engagement point of view. You can still comment; and actually, I like where the comment is structured on the channel (the top to the right of the video). After leaving a channel post, you can view your post as well as others' posts. In fact, the only way to see the comments is from either the feed section or after you’ve submitted a comment. The recent home page changes mean big things for YouTube. Social is what’s on their mind—and the home page, having more personalization, reflects that. The channels you’re subscribed to are in list form under your profile on the left. The middle column shows all the activity of those whom you’ve subscribed to. And the Pinned feature allows you to take your top 10 YouTube users and have their information fed to you first. So How is this Powerful? The benefit is that you can scan the activity of those YouTube channels within your same niche to discern if their patterns on YouTube are successful or not. I don’t have to look too far to know what someone I subscribe to is doing. It’s right there in front of me. Not only that person’s upload patterns, but also the frequency of his/her communication—video commenting and channel subscribing—ultimately, how he/she is using YouTube socially to establish relationships. YouTube will not stop with their changes. They’ll continue to make the platform more social user–based. That, coupled with their push for more original content, may mean that they are not yet out of the social race. They might not win this year. 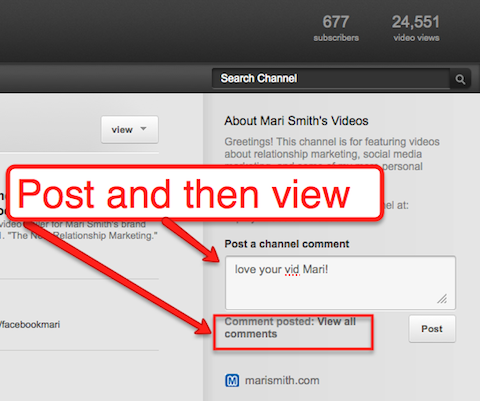 But if you think about Google+ integrating fully with YouTube, you can definitely see a powerhouse to be reckoned with. What do you think? How do you feel about the changes to YouTube—both from the marketer’s and the viewer’s points of view? Please leave your questions and comments below. 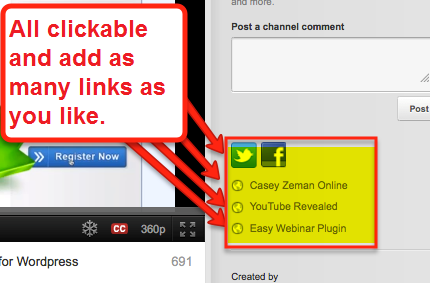 Casey Zeman is the creator of YouTube Revealed and Easy Webinar Plugin. He teaches a method for traffic and lead generation by harnessing the power of video through attraction marketing.